This story originally aired on World Vision Report in March 2005. 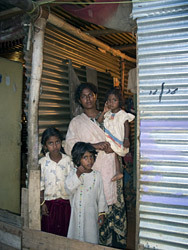 BANGALORE, INDIA — According to the World Bank, India is the world’s fourth-largest economy in terms of purchasing power. This is partly due to its success in the information technology field. In this report from India’s IT capital, we find that there’s been no trickle-down effect for many of that city’s poor. One-fourth of its residents still live in slums despite the influx of jobs and money, and their circumstances are becoming even tougher.